I thought I would be clever and take the free trials to both these websites and get two months worth of DVDs. Unfortunately both of them have decided to charge me for a months subscription even though I cancelled my free trial in time. Ba$tards! However every cloud has a silver lining. This gives me a chance to test my complaining skills! I have exchanged many emails with both of them so far and I think I will win one fight and lose the other. Other things to complain about are trains. I got on the train at Oxford to travel to London on Sunday. Then I sat on the train for half an hour in the station. The train was packed but I got a seat at least. Then they said they didn't know when the train would be able to leave. So after half an hour waiting I went to catch the Oxford Express to London. I should have just trusted the bus in the first place. How crap can the British trains be to just cancel and entire train after leaving you on it for 30min. Idiots! Let the train tale the strain. Let the train take my arse, the bunch of useless morons. Wouldn't happen in Switzerland. We've booked our ski holiday for Feb next year. We will be staying in Chalet Martin near Gryon. Can't wait. I know nothing about the ski area or anything like that yet. 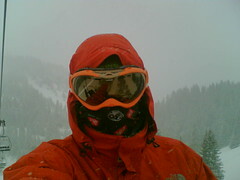 It's been two or three years since I last went ski-ing so I am really mising it. Hopefully I am not too rubbish now. Wendy will be ski-ing for the first time so hopefully she enjoys it. I used to be with Screenselect because I had a lot of free time when I first moved to Leicester, and had my fair share of nightmares. However as a rule of thumb any "free" service that needs your card number isn't free. My problem was I deliberately went below the minimum on my list, moved house and still had DVDs delivered to my old house by the blithering idiots. Then the painters who were doing up my old house for a new batch of students stole the DVDs... it was a fun time with ScreenSelect.